Where each of the City’s numbered streets between 6th and 11th Streets meet the Columbia River, a short bridge connects the solid-ground road to the over-water pier structure. The City refers to these six bridge structures as our waterfront bridge structures. The waterfront bridges are of utmost importance to the City as they provide access to a critical portion of our waterfront. They provide both pedestrian and vehicular access to many businesses and attractions. In addition, they provide very important emergency vehicle access to the waterfront. Currently the structures are all load limited. 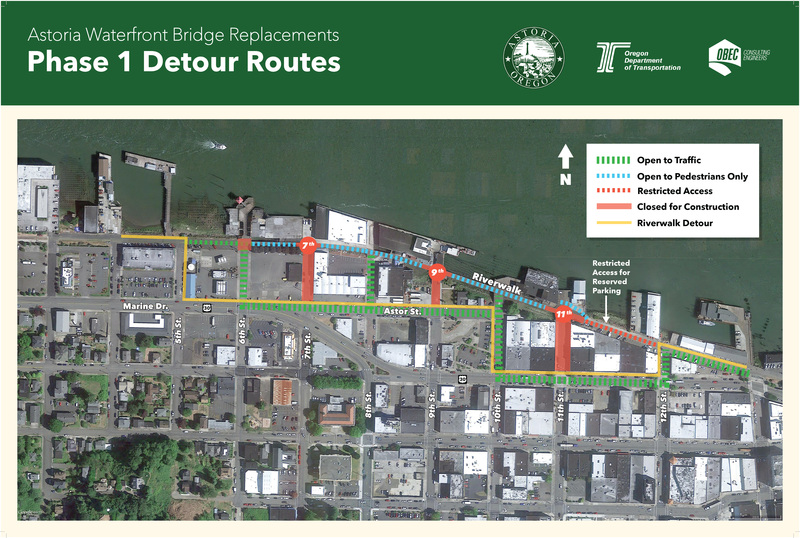 The City received funding from the Oregon Department of Transportation through the Local Highway Bridge Program to replace the six waterfront bridges. This funding provides 90% of the replacement cost with the remaining 10% provided by the City. OBEC Consulting Engineers provided the engineering services for this project. Legacy Contracting was awarded the construction contract. See bridge design sketch here. Construction of the first phase is scheduled to begin in early October 2018. Odd numbered streets (7th St, 9th St and 11th St) will be reconstructed in the first phase with an anticipated completion of late May. Even numbered streets (6th St, 8th St and 10th St) will be reconstructed in the second phase that is scheduled from October 2019 through May 2020.